The tree was grown from the pip of a supermarket apple by Anne Markwick at Stanmer Park during the 1960s and raised by Plumpton College Horticultural Training Centre, Stanmer Park, Brighton & Hove. The fruit is medium in size with a round conical shape. The skin is flushed orange-red with broken red stripes on a yellow green background with some russeting. There are prominent white dots on the skin (lenticels), and it is slightly greasy. The flesh is crisp and fine textured with a greenish tinge, juicy and sweet with a rich flavour. The fruit hangs on the tree and can be picked in late September. 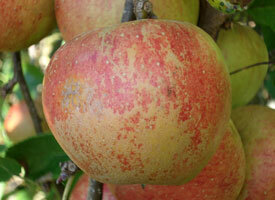 The Stanmer Pippin forms an upright, spreading tree that is moderately vigorous.